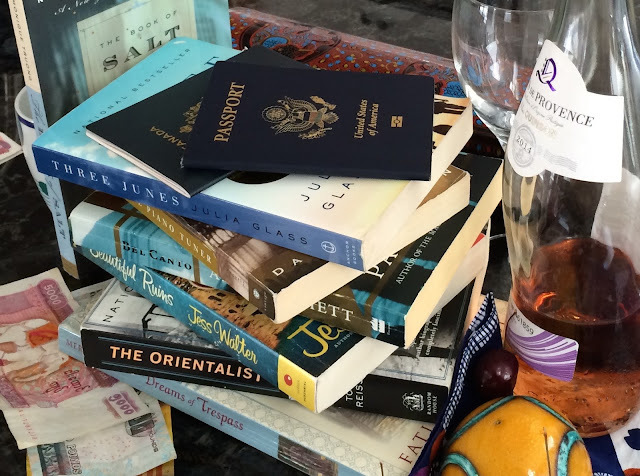 Reading and traveling – does it get any better? These books have kept me company on long flights and sleepless nights, on the beach and in shabby hotels with bad lighting. Some are fun – even hilarious, some are great adventures, some are historical companions. Most of these are novels, but some are memoirs, travel observations, serious contemplations of the world. Here they are in no particular order with their original publication date and my comments. Most of these are available on Kindle. The Physician. Noah Gordon 1986. Big. Almost 1,000 pages. One of the best travel adventure history books I’ve ever read. A pre-Norman Conquest English orphan yearns to become a physician. Disguised as a Jew, following the Crusades through Southern Europe, the Balkans and into Persia, he learns medicine, befriends princes and philosophers, defies religious authority, survives plague and betrayal. This will take you on a very long plane trip and back. The Great Railway Bazaar Paul Theroux 1975. A classic. Especially if you are on a long, long train ride. Nearly 35 years later he wrote an update: Ghost Train to the Eastern Star. 2009. Bel Canto Ann Patchett 2001. If you have secret fears of being kidnapped in a nameless Latin American country by a band of charismatic guerrillas – don’t read this. Actually do read this – you won’t put it down. Travels with Myself and Another; Martha Gelhorn. 1978. an under appreciated classic. The third wife of Ernest Hemingway and one of the first women war correspondents. A memoir of her years of travel – the long story of visiting China and Taiwan in WWII with the nameless famous husband is terrific. The Poisonwood Bible, Barbara Kingsolver. 1998. A big, rich, wonderful, deep book of a missionary family living in the Congo in the 1960s. The daughters in the story almost come off the page and stand right by your side. There could have been a mild earthquake while engrossed in this book and I wouldn’t have noticed. Lacuna , Barbara Kingsolver. 2009 1940s Mexico with a reimagined Frida Kahlo, Diego Rivera and Leon Trotsky. Travels through McCarthyite America. Kingsolver is a world-class story-teller. Big scope and big plot and all the colors and vibrancy of Mexico. Baghdad Without a Map and other Misadventures in Arabia – Tony Horwitz, 1991. One of the funniest books I have ever read and depressingly still relevant. As the trailing male journalist spouse to Geraldine Brooks, WSJ reporter to the Middle East in the late 1980s, Horwitz sets off on his own exploration of the Arabian Peninsula, north Africa, Iraq, Iran and the Levant. Don’t fly into Libya while reading this book. Especially if you are the only white guy on the plane who happens to have a Jewish last name. The Gastronomical Me. MFK Fisher, 1978. MFK Fisher is one of the first American food writers, a terrific memoirist, a wonderful short story writer; you can’t go wrong. Life and food in pre- and post WWII Europe, Mexico and California. In a Sunburned Country Bill Bryson, 2000. Travels in Australia. Anything by Bill Bryson will take you happily around the world. Laugh and learn through his mishaps and misadventures. Have a fear of creepy-crawlies? Or big fish with sharp teeth? He’s your guy. Undress me in the Temple of Heaven, Susan Jane Gilman, 2009. Starts like a memoir (it is) of clueless college grads heading off to backpack the world starting with the just-opening China of 1986. Ends as a can’t put it down, middle of the night, keep the lights on, hairs-on-the-back-of-your-neck true thriller. If you are traveling off-road in China, don’t read this. Actually, DO! Dreams of Trespass – tales of a Harem Girlhood. Fatima Mernissi. 1995. A memoir of growing up in Morocco with two mothers. Beautiful and lyrical. A peak into a (thankfully?) vanished world. Down and Out in Paris and London. George Orwell. 1933. A classic. How to survive on pennies a day in Paris and London as a starving writer in the 1920s. The Madonnas of Leningrad Debra Dean. 2006. Just lovely. As an aging matriarch slips into Alzheimers, she remembers distinctly her years in the Hermitage as a curator during WWII. Each painting is a friend. I don’t know anyone who hasn’t loved this book. The Imperfectionists, Tom Rachman. 2010. Fun. An English language newspaper struggling in Rome and its cast of misfits, striving journalists and wandering expats. Inside a Pearl; my years in Paris. Edmund White. 2014. Memoir. If you ever wanted to know what it was like to be young, gay and promiscuous in Paris, this is your chance. Don’t Let’s Go to the Dogs Tonight: An African Childhood. Alexandra Fuller 2001 Growing up in Rhodesia as it convulses into Zimbabwe. Funny, poignant, well written from the perspective of a young girl who can shoot straight for whom midnight marauders and dead drunk parents are perfectly normal. Night Soldiers. Alan Furst 1988. Pre-war Europe. If you love that Mittle-Europa pre WWII angst that ran from Moscow to Warsaw to Berlin to Paris to Madrid, and can watch Casablanca repeatedly, every one of Furst’s books is a gem. This is the first in a series of 11 books. The Piano Tuner. Daniel Mason 2002. How do kids in their 20s write these amazing books? Burma – late 1880s. A vividly imagined tale of a young man sent to tune a piano belonging to an eccentric (and possibly demented) British colonel deep in the jungle up the Irrawaddy river. You are so there. Everyone goes native and scary, wondrous stuff happens. Three Junes. Julia Glass. 2002. Greece to Scotland to NYC. Generations of a Scottish family. Great story-telling. I think I flew across three continents reading this and didn’t want the plane to land. The Orientalist. Tom Reiss. 2005. From Baku to The Russian Revolution to Berlin to New York, the true story of Lev Nussimbaum – a man of many swashbuckling disguises and talents. How journalist Reiss tracked down his story is the best part of this magnificent book which parallels the agonies of the 20th century. The Book of Salt. Monique Truong. 2003. A reimagined Ho Chi Min meets a young Vietnamese chef in Paris who works for Gertrude Stein and Alice B. Toklas. Wonderful, aromatic (he’s a chef) scenes of French Indochina. Paris to the Moon. Adam Gopnick. 2001 If you love Paris, and you love The New Yorker and you think Adam Gopnick is a terrific down-to-earth teller of personal tales and observations, read this. The Piano Teacher – Janice Y.K. Lee Hong Kong WWII Expat life in glamorous Hong Kong pre WWII until the very nasty Japanese invade. Caviar to prison camp in one fell swoop. Love story, lyrical. Not first on my list but very atmospheric. Beautiful Ruins – Jess Walter 2012. 1960s Italy, Hollywood. Re-imagined Elizabeth Taylor and Richard Burton. A great romp. Very funny. Very clever. Balkan Ghosts. Robert Kaplan. 1993. Kaplan gets serious. His journalist travels through the 1980s Balkans predicted every single awful thing that came to pass in the break-up of Yugoslavia. Maybe don’t read the first chapter if you are en route to Romania. The Ends of the Earth: From Togo to Turkmenistan, Iran to Cambodia – a Journey to the Frontiers of Anarchy. Robert Kaplan. 1997. The title says it all. Kaplan is heavy lifting but so worth it. If you are traveling with extra luggage, his tiny knapsack will put you to shame. His breathtaking observations will pop the eyes right out of your head. The Glass Room. Simon Mawer 2009. Pre – war Czechoslovakia. Modern architecture, a love triangle and looming war. Back to that Mittel-Europa angst that I love so well. A Tale for the Time Being. Ruth Ozeki 2013. Post Tsunami Japan. Coastal British Columbia. A Japanese schoolgirl’s lunch box traverses the Pacific to land in the hands and imagination of a Japanese-American author with writer’s block named Ruth. Back and forth from Canada to Japan to explore the poignant life of a Japanese teenager and her Buddhist nun great-grandmother. That’s the first installment! Happy reading.